As remembered in the coat of arms of the Municipality through the written Descendit ex patribus romanorum Amalfi was founded by some Romans in route for Costantinopoli. Surprised by a storm in the gulf of Policastro they landed founding Melphe from which they went away subsequently founding Amelphes, meaning coming from Melfe. In the mythology instead the birth of the village is linked to the Hercules' lovings enterprises who loved a woman called Amalfi who then died very soon. 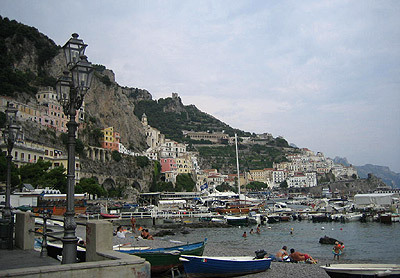 The hero wanted charming place to bury her and chose this part of the coast founding Amalfi. The first historical testimony dates back to 533: during the Gothic War, Narsete defeated the Goth Teia and Amalfi passed under the dominion of the Western Roman Empire. It then acquired importance as testified from the fact that became episcopal center in VI cent. A.D. but remained the center of the fights between Longobards and Byzantins. It was in this sphere that the last Duke of Benevento Sicardo plundered the city in 836. As often happens from worse came the most magnificent history of Amalfi. In few years in fact weaving relationships with the two states (Longobard and Byzantin) and defeating the Saracens the village managed to acquire its own independence culminated in 850 with the proclamation of the Republic. Command was given at the beginning the prefects, then calls judges and finally doges, as in the Republic of Venice. Amalfi, even under the influence of Western Roman Empire, was pratically independent as it demonstrated coining its currency and issuing its laws. Its power on the sea went increasing like its wealth until the XI century when it passed under the administration of the Duke of Salerno (1039) and later under that one of Normans (1073) called in aid of the Amalfi against Salerno. Arrived in the history, called in aid against the Normans also the Pisans (1135) who, betraying the pact, plundered it. In 1343 the city was devastated by a seaquake that destroyed the great part of the ancient Amalfi cancelling the splendour of the past. The power of Amalfi on the sea sure is testified through the Tavole Amalfitane (Amalfitane Tables). Adopted at that time by all the seafaring nations, the Tables ruled the relationships between shipowners, sailors and merchants. Amalfi flourished again thanks to the first tourism (first half 1800) and the modern one past century and of puts into effect it them that they have rendered Amalfi the epicenter and the towing of all the coastal Amalfitana. Greater monument of Amalfi, after the beauty of its bay and the sea, is the Chatedral of Sant'Andrea in Arab-Sicialian style, with beautiful bronze portals (1066) and a facade with mosaics reconstructed in 1861, after a collapse. Sideways it rises the beautiful bell tower (1180).